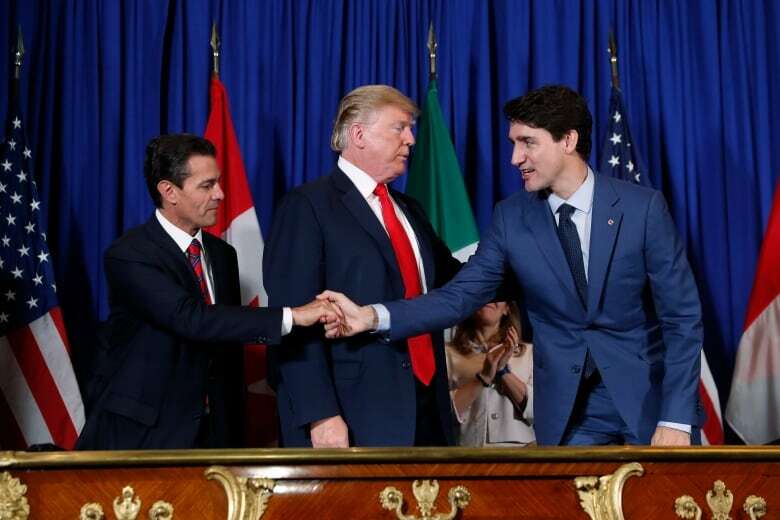 The road to rewrite the North American trade agreement was a "battle," Donald Trump said Friday as Canadian Prime Minister Justin Trudeau and Mexican President Enrique Pena Nieto joined him for a signing ceremony on the sidelines of the G20 summit in Buenos Aires. Nevertheless, "battles sometimes make great friendships," Trump said as the other two leaders looked on. Foreign Affairs Minister Chrystia Freeland is meeting reporters in Argentina at 10 a.m. ET, and CBC News will livestream her remarks. Trudeau referred to the deal Friday morning as the "new NAFTA." In remarks at the signing ceremony in Argentina, Trudeau said this signing lifts the uncertainty that surrounded the acrimonious 15-month negotiation process, an uncertainty that "only would have gotten worse" if the parties had not reached a new agreement. The signing followed days of speculation as to whether Canada would sign the USMCA at all, and if it did, whether it would be signed by a more junior official than the prime minister. On one hand, Canada wanted to register its displeasure at signing a free trade deal, when in fact there are tariffs on $ 48 billion worth of goods traded between the U.S., Canada and Mexico. Those tariffs began with U.S. action against imported steel and aluminum, using national security as a justification under an obscure U.S. law from 1962. Canada and Mexico in turn retaliated with tariffs against the U.S. All those tariffs remain in place as the USMCA is signed, much to the displeasure of both Canadian and Mexican governments. Both the White House and the Mexican government said openly in the days before the signing ceremony that it would involve the leaders of the three countries. Only Canada sounded a somewhat sour note, saying there were still difficulties in the text and hinting it was reluctant to have a celebratory signing of a free trade deal marred by tariffs that suggest anything but true free trade. Canadian officials in the room Friday characterized their mood as more of a relief than a celebration. There is disappointment that the steel and aluminum tariffs have not been lifted. In the end, the ceremony was brief, with short remarks from all three leaders before they sat together at the table and signed. The audience then rose to leave, obscuring the view of each country's responsible ministers as they continued to sign other documents related to the agreement. They included a critical side letter on the automotive sector that could ensure Canada avoids punitive tariffs on its car exports to the U.S. if the Trump administration proceeds with threats to begin taxing foreign vehicles and automotive parts at up to 25 per cent. Conservative Leader Andrew Scheer will react to the agreement at 10:30 a.m. ET and CBC News will carry his remarks live. On Saturday, he will be replaced by Andres Manuel Lopez Obrador (AMLO), a politician who represents Mexico's left, and who has often questioned the value of the original NAFTA and international trade generally. The agreement now proceeds for ratification in each country. In Canada, implementation legislation will be drafted for Parliament, and after it is reviewed, debated and passed, the federal cabinet will ratify the treaty. Mexican legislators will also vote on the deal, but it is expected to pass. The situation is far less certain in the U.S., where an acrimonious debate is expected, thanks to a Trump-unfriendly Democratic majority in the House of Representatives following November's midterm elections. Even in the U.S. Senate, its final vote may be close. Some Republican senators have been critical of Trump's trade policies, while prominent Democrats, including potential presidential candidate Elizabeth Warren on Thursday, have said they cannot vote for the agreement as it stands. U.S. Trade Representative Robert Lighthizer said Friday that the Americans have negotiated what they believe is a "bipartisan agreement," designed to win more than enough votes to pass.